While drones are used for all types of purposes, photographers in many industries can benefit from the photographs and videos they can take. You don't have to spend thousands of dollars, either. Many drones have moderately good cameras and equipment and cost under a thousand bucks. Drones might have been futuristic technology in 90's sci-fi flicks, but they are quickly making an impact in current society. In essence, a drone is an unmanned flying aircraft you control remotely. Military drones can have intricate remote systems, but your run of the mill commercial drone will typically have a controller or even be controlled by your phone. Not only are they the most wanted toy on many kids' Christmas lists, but they are finding uses in aerial photography, real estate, the military, and dozens of other industries. While not all drones have a camera mounted on them, most do come with the ability to mount a camera that allows you to take amazing aerial videos and photographs. How Good Are the Cameras? You get what you pay for, and drones are no different. Budget drones are available, and these are typically under $200. These drones are typically equipped with a camera that takes pictures in the 1-2 megapixel range, along with 480p to 720p video quality. Some are even equipped with a GoPro. In addition to having lower quality cameras, these drones usually have a lot shorter fly time before they require a recharge. If you are a professional drone flyer and willing to drop more than a few hundred bucks, you can find drones with camera qualities of 12 to 20 megapixels and 4K to 5.2 RAW video resolution. These types of drones can range from just under $1,000 to well over $2,000. These drones also have better flying times at about 15-30 minutes, depending on the model. In 2017, DxOMark, a camera sensor testing company, rated the sensors on drone cameras and found they rated from 74, which is the quality of a high-end digital camera like the Olympus Mark II, to about 34, which is cell phone quality. There are several advantages to using a drone with a camera for photography. First and foremost, drones can offer the ability to take aerial shots for not only fun but for industries like construction and real estate. They allow photographers to get higher perspectives that wouldn't otherwise be possible. Cameras offer the ability to create specific effects in the air that wouldn't be possible from the ground. 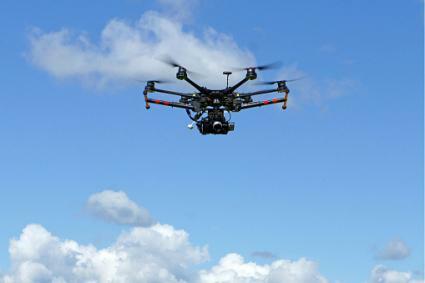 Drones also make aerial photography easier and more affordable for photographers. They are cost effective compared to renting a plane or helicopter. There are several different options available. 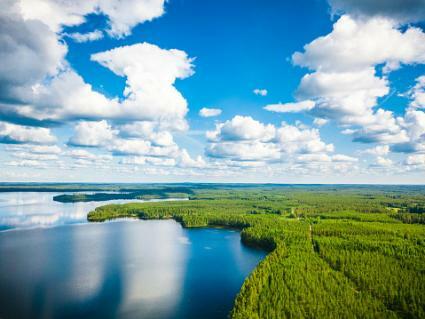 Drones are safer for the environment than an airplane and are able to fly in all types of areas where it might not be possible for a pilot to go. The fly times and battery life of these machines are limited even at the higher-end of the spectrum. There are some legal issues with flying a drone that may require certification based on how you use it. For example, PC Magazine notes you must not fly above 400 feet, near airports, groups of people, stadiums, or sporting events, or near emergencies when emergency response professionals are attempting to do their job. Additionally, the FAA may require some drones to be registered depending on size. Drones can also invade a person's privacy. 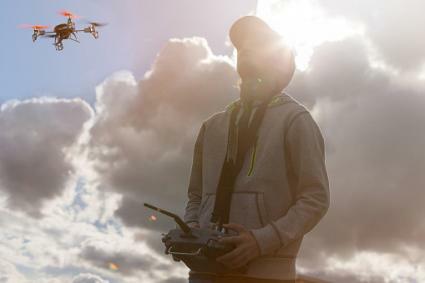 For example, UNLV Center for Crime and Justice Policy conducted a survey that stated that 72 percent of people were very concerned about the use of drones to monitor their lives. So, you've decided that despite the disadvantages, you want to give drone photography a try. How do you make your images great? A few simple tips can take your aerial drone photography from just okay to extraordinary. If possible, shoot your drone images in RAW format. This will allow you to get the most out of every pixel available in your camera. Consider your ISO. Using a lower ISO in your drone camera allows you to minimize the noise, but you need to be aware of shake too and use a higher shutter if possible. Consider taking several shots in a row to make a panoramic image. This allows you to get the most bang for your buck, due to the lower quality on a drone camera. Use the camera's features to your advantage. For example, use the grid on the camera to help you compose a shot. As in traditional photography, play with angles and exposure to create unique images that push the limits. For example, you don't always have to shoot looking down. Sometimes, different angles can give you unique imagery. Additionally, it can be helpful to use Google Maps to scout new locations. Likewise, check the forecast to ensure you won't be flying into dangerous conditions for your drone. Holy Stone HS300: This drone features a 1080P HD wide-angle camera for taking aerial footage and photos. This will be equivalent to about a 2.1-megapixel camera image, which means you will have a lower end image. However, it does offer an altitude hold and speed control, as well as one key landing and headless mode. Found on Amazon for $200, the Holy Stone HS300 was featured in the second spot by Drone Supremacy in their Best Drones Under $200. Parrot AR.Drone 2.0 Elite: Listed in the first spot in the Drones World Top 10 Drones Under $200, this drone features a HD 720P camera that can record directly on to your smartphone or tablet. Images on this camera will compare to a 1-megapixel image. Considering the distortion in a 12-megapixel image when you blow it up, you can probably imagine the image clarity will not be that great. However, it uses WiFi technology to turn your phone into the remote and features absolute control piloting mode that allows you to tilt your smartphone in any direction to see the drone. It also boasts a unique stability system that allows it to fly in winds up to 15 mph. It has an Amazon price tag of $299. DJI Mavic Pro: Featured on The 5 Best Drones Under $1,000, this drone features a sleek design and 4K video. It also takes 12.71-megapixel images. It has a max fly time of 27 minutes and integrated GPS. It is also equipped with built in WiFi and allows streaming video in a 4-mile range. You can snap this drone up for about $1,000. DJI Phantom 4: Listed among top ten drones in several lists, the DJI Phantom 4 features a Gimbal 4K, 12MP camera that allows you to take RAW photos, and a built-in sensor that can help you to avoid those pesky obstacles. It can also travel up to 3 miles and reach top speeds of 44mph. It has a GPS navigation system as well as indoor navigation using visual positioning and 27 minutes of flight time. DJI Inspire 2: Given an excellent review by PC Magazine, this drone features a 5.2K in CinemaDNG Raw video system as well as the ability to take stills at 20.8 megapixels. You can use the high-speed sports mode to capture those shots, and it features interchangeable cameras. It also features a 360-degree camera rotation and dual operator control. This big drone will cost you a big chunk of change; however, with BeachCamera.com listing this at $5,500. DJI Inspire 1 v2.0 RAW: With a slightly easier to swallow price point of $3,800, the Inspire 1 offers an impressive 16-megapixel still camera with a 15mm f/1.7 lens. The Zenmuse X5R camera is a mirrorless camera that boasts video at up to 4K. 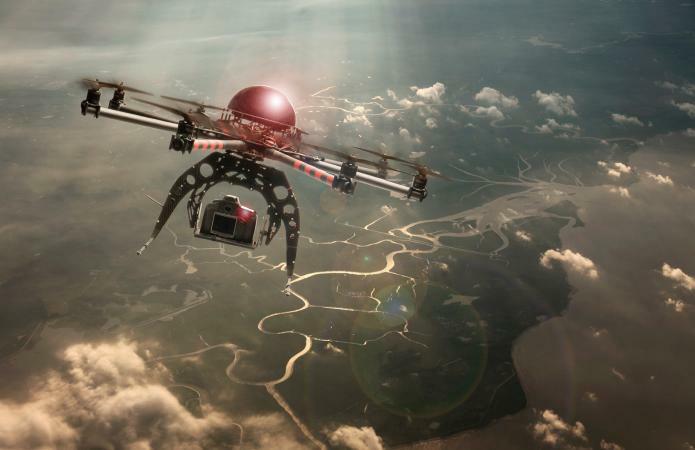 This drone was designed for aerial filmmaking and can give you crisp, sharp images. Other features include a raw video recording, shot stability, and the ability to pan 360-degrees. This drone also features app-based control software and indoor flying sensors. Whether you just want to hop on the drone bandwagon or you are looking to take professional aerial portraits using a drone, there is a machine to fit your needs and your budget. While the lower-end drones can't offer high-end image quality, if you are in it for your own personal enjoyment or to play with some aerial photography, these drones can fill your needs. Mid-grade and high-end drones have a lot more to offer but can make a huge dent in your wallet depending on how far down the rabbit hole you want to go. However, if you are looking to make cinematic type or high-end imagery, you can't go wrong with a high-end drone equipped with a camera. Now weigh your options and decide if droning is right for you.